7352 Horizon Drive in Ibis Golf & Country Club is the estate you have been searching for! 5 bedrooms | 4.1 bathrooms | 4,525 sq. ft. The crown jewel of this property is arguably the custom ''Petit Cinema'' - a jaw-dropping home theater, with eight leather recliners, a real ticket booth, concession area with beverage cooler, and Sony 4K Ultra HD projector with high definition capabilities that will show every single detail of the big game, the latest action flick, or your favorite TV show up close and personal on a custom, expansive 118" theatre-grade screen. Control the entertainment from the home's customized tablet and let yourself slip into complete surround sound from within the sound-insulated walls of your complete entertainment personal theatre suite. This beauty of a home on Horizon drive was built in 2007 by the esteemed home builder (and Ibis favorite) Dreamstar and fully customized to perfection by current (and original) owner with one-of-a-kind features that you have to see in person to truly appreciate. Enter the home's gorgeous custom front doors and immediately be swept off your feet by soaring cathedral ceilings with detailed marble painted in-lay, thick moldings, and spectacular marble floors. Shake yourself up a Manhattan from the home's sunk-in bar and round the corner to the home's gourmet kitchen, featuring an all-star line up of appliances, oversized island, and hidden butler's pantry leading to the home's formal dining room. After a long day golfing one of the three award-winning Jack Nicklaus golf courses or lounging on Palm Beach's finest beaches, retreat to unwind in your luxurious owner's' suite on the west side of the home anchored by huge his & hers walk-in closets with beautiful custom built-ins, his & hers vanities, and a relaxing large rain shower overlooking a private orchid garden. The custom patio and backyard are truly an entertainer's dream (in fact, current owner is known for hosting Superbowl parties with 100 guests! ), with a large screen enclosure, designed to keep your relaxation to a maximum and debris & bugs to a minimum. 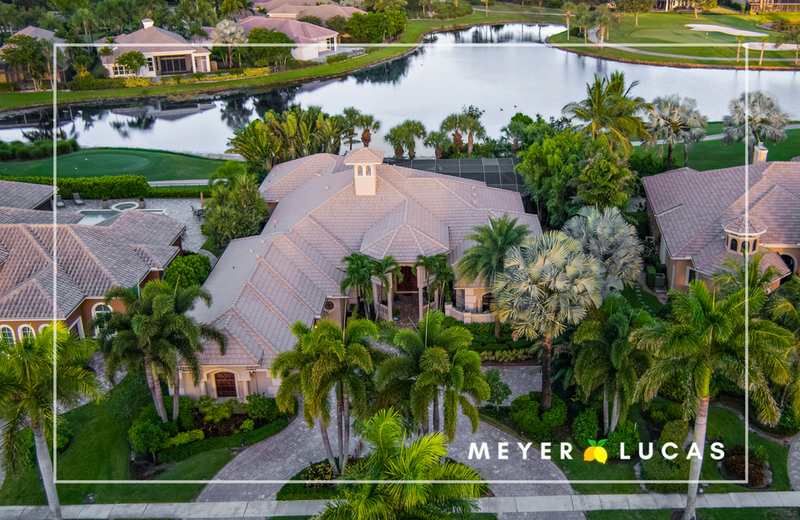 Sip your morning coffee on your patio with gorgeous pecky cypress ceilings overhead and enjoy sweeping views of relaxing waterfront and manicured fairways from behind complete privacy of lush, custom landscaping by the esteemed local landscape architect, John Lang. The home's sparkling freeform pool is simply magnificent with a beautiful custom waterfall feature providing tranquil ambiance from the pool's elevated, oversized spa, which is enough for you to full stretch out and live your best life. An oversized & extended 3-car garage caps off the home's endless features and includes three new garage door motors, hurricane impact doors, and a fully enclosed, air conditioned storage area inside the garage. The owner had the garage widened to accommodate side-by-side parking and to allow cars to be pulled in completely. Schedule your showing of this masterpiece of a home today and be swept off your feet by everything this beauty on Horizon has to offer.